At the turn of the century, hundreds of wannabe industrialists jumped into the burgeoning horseless-carriage industry. At the turn of the century, hundreds of wannabe industrialists jumped into the burgeoning horseless-carriage industry. One such startup, the Badger Motor Car Company, began production of its 1910 30-horsepower, 4-cylinder, 3-speed-transmission car in the rural Midwestern town of Columbus, Wisconsin. But like the majority of early automakers, the effort was was short-lived. Despite positive reviews, dealers thought the cars were underpowered, and by April 1911, the company was in liquidation. Fast forward 104 years, when Columbus resident Darvin Frey was looking for a unique setting to house his eclectic collection of cars, snowmobiles, motorcycles, automobilia, porcelain signs, collectibles and antiques. Sandwiched between the town’s railroad tracks and the Crawfish River was a 1920s building originally used as the Ibisch Casket and Vault Company. 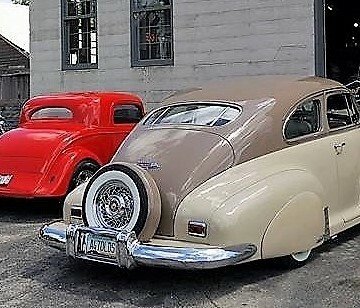 Frey set about fixing up the old warehouse while working on the various cars in his Depression-Era collection, which included a 1930 Ford Model A taxi, a 1930 Ford roadster pickup, and a 1925 Ford Model T. His uncle suggested the building would be a great site for a micro-brewery. 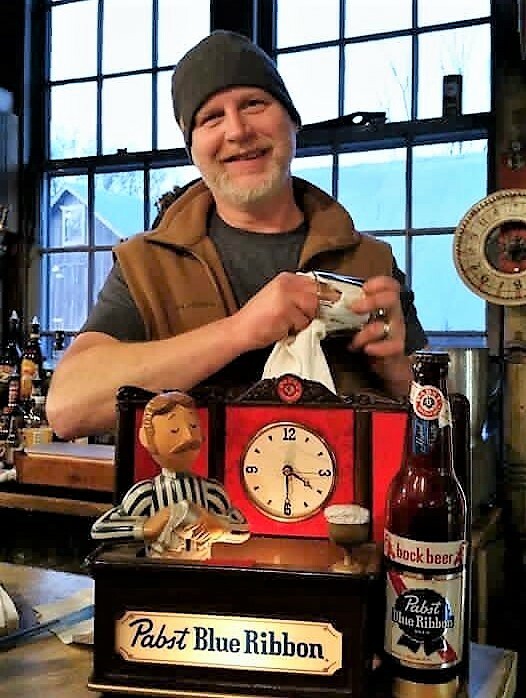 While Frey knew nothing about brewing, he applied for a liquor license to feature other local micro-brews and spirits, taking the name of the town’s former automobile manufacturer, The Badger Motor Car Company. At first, Frey thought he might get a couple of retired guys who would stop in to have a beer and watch him tinker on his car projects. But soon the unique tavern was the toast of the town, with its automotive-museum-like setting and retro couch seating conducive to special gatherings. 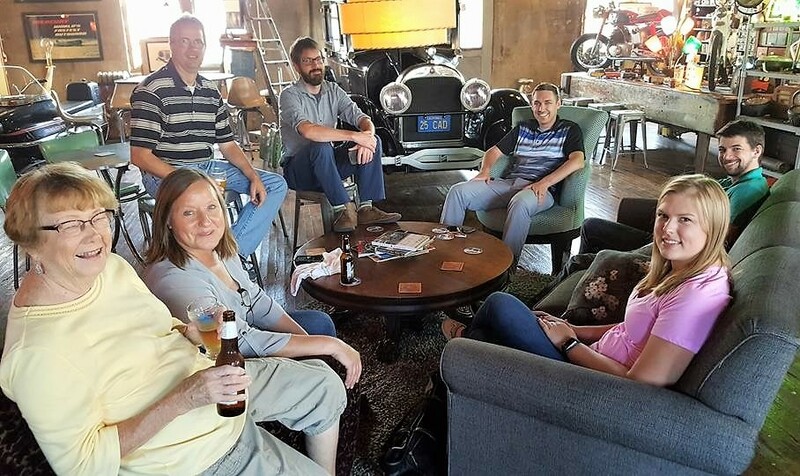 Car enthusiast from all over the Midwest have found their way to the tavern to have a cocktail and admire Frey’s latest project, a 1931 Oldsmobile Coupe sporting a 1955 Rocket motor complete with J-2 Triple carburetor setup. Celebrity car buffs including NASCAR driver Matt Kenseth and TV’s “American Picker” Robbie Wolfe have been spotted perusing Frey’s 1970-era Japanese motorcycle collection while sampling a craft beer or two. Frey has big plans for the Badger Motorcar Company, including the use of two old stake trucks to support an outdoor deck for summer visitors. The tavern will host a “Tin Man Triathlon,” with a run-walk mini marathon and kayaking on the nearby river. He also envisions families taking the Amtrak Hiawatha train from Chicago to stay the weekend in friendly Columbus, without having to spend a minute behind the steering wheel. When asked what car he’d like to add to his tavern’s car collection, Frey was quick to answer.